I can not say why the uniflow engine of that steam launch behaved like this, but the first thing, that springs in mind: that boat's powertrain had a much too large moment of inertia in relation to its engine size. I read relatively often, that the high compression ratio gets listed as a disadvantage of an uniflow steam engine with some using high-inertia flywheels or elements in general to overcome it. This means an engine becomes less responsive the bigger the flywheel is. Moreso if the engine wasn't so powerful, making a change of the shaft rotation slow and cumbersome. Maybe coupled with tricky valve timing. I never saw that engine, so this is just a thought of what could cause that behavior. Compression ratio can be overcome in 3 ways: A higher rotational mass of the powertrain, a faster rotation or more cylinders with different crank angles. Only the first one makes the engine act slower. But I wouldn't say uniflow engines in general are inflexible and unresponsive. The uniflow principle as it was taken into the hand during the 20th century always seemed to me as a sort of pinnacle of reciprocating steam engines and I suspect they would have even stepped into the place of the IC engines, if the IC engines hadn't been a success story. Uniflow steam engines have the advantage over corliss engines and all the other designs, that I have in my mind right now, that they address some issues of the steam engine, which hadn't been addressed like this before: The compression - usually seen as something negative in engines - gets turned into a thermodynamic advantage. The expansion cools down the cylinder walls, but the compression increases it again BEFORE new steam is let in. This is a steam engine's designer dream come true. If there can be fiddled with steam engine efficiency in any way, the best is to fiddle with the thermal efficiency. Yes, mice are hungry. But my engine is going to be somewhat of a well-fed rat. Not an efficiency-tuning masterpiece, yet big enough to see and learn how the thermodynamics work in an opposed piston design. I am not so much scared about how to design the cams, but of what the designing means for the engine. My engine would have an inlet opening of over 70° of one crank rotation, translating to a 90% expansion ratio (for simplicity reasons, ignoring the exhaust port part of the stroke) The cam size is defined by the valve lift and this angle. Thus, the cam would need to be almost as big as the piston diameter is to work properly. This is what I was worrying about the most. Maybe with some rocker arms on the cam, I could reduce the cam radius difference to 1mm. Then, it would look better sized. Actually, rocker arms could be the way to go. Why not. Now, letting it all sink in, I had the spontaneous idea to build both valves and make them interchangeable. That way, I can try out both systems - poppet valves and the rotational valve. Since the intake valve assembly would be a register attached to the side of the engine, it would be very easy to accomplish without any hassle. And my plan right now is to build a one-cylinder tryout engine to find the best working conditions and then realize them in a multi-cylinder version. This way, I can keep the costs for design flaws and remodeling to a minimum. And I can not stress this out enough. This will be a very cheap engine. The only costly parts will be the gear and the cylinder. In worst case, the cylinder will cost ~100 €/$. So, I calculate an overall price of 250€ for the engine. Barts, you build a 5,75"x5,75" uniflow engine? I will definitely look over the Sea Lion thread. Last edited by Ramón on Tue Mar 05, 2019 9:36 pm, edited 2 times in total. The O'Connor engine was precisely the engine that regularly and unpredictably failed to reverse on command. Al Giles eventually did the unthinkable and replaced it with a small 'dissel' engine which is still in the boat. Bart is doing an end run around the reversing issue by not reversing it. Again, I personally have far more pressing issues with my power plant than chasing the "Willow the Wisp" of higher efficiently. Fuel is cheap and life is short. I just want to move along silently and peacefully in calm waters. Designing a new steam engine is a significant task, with much research and engineering required. I wish you good luck in your endeavor. As far as the expressed difficulties associated with high compression in uniflow engines, it is true that they give less constant torque impulses than conventional steam engines, but also far less of a problem than Diesel engines, so based on technical history here, this is a very solvable problem for the uniflow. There have been many attempts to use rotary admission valves on steam engines, it is so easy to get fully adjustable cutoff with these designs. Generally these rotary valve setups have become complete failures, and require excessive lubrication for any hope of ordinary life. My domestic heat-power module uses a single cylinder, single acting uniflow engine, with a poppet admission valve that allows sharp cutoff, and it has never given problems. Variable cutoff can be designed into this, but in steam launch service, this is an unnecessary complication. Yes, uniflow steam engines have more torque-over-angle characteristics of an IC engine. In general, uniflow engines closed the gap between steam and IC propulsion in quite some regards. I am still thinking about what could cause an engine to have trouble reversing. There was not enough information to tell it. What could caus an uniflow engine to have troubles reversing? : For reversal, the power of the engine would be probably throttled. While in this situation, the p-V-diagram of the compression stroke would change little in comparison the the p-V-diagram of the power stroke. At the end, the input would be too little to overcome the compression as long as the engine works in a region of greatly reduced power. I remember reading a lot about uniflow engines and Stumpf solved the compression ratio at start-up (but valid for all very low fill events) is to have an additional dead space switched together with the normal engine displacement. This was done by a manually operated valve. The additional dead space was designed to keep the compression ratio smaller than during the normal working condition. If someone has problems with reversing an uniflow steam engine, they might be successful with adding some means to reduce the compression ratio temporarily (or permanently): Either addable dead space or additional outlet valves, that could be operated either for the occasion of reversing/starting the engine or permanently implemented. An electric starter would also be possible, though I would not use it myself. I can not but see another potential error source. Preventing the reversal of the engine, one could also use a reverse gear. In my engine, I really don't care. It is supposed to be a simple design without much fuzz. There will be a solution one way or the other. Last edited by Ramón on Mon Jan 21, 2019 4:51 pm, edited 1 time in total. Having dug up images of the original Briggs & Stratton cam, I realized my worries might not be that substantiated. I almost had to laugh. The cam geometry is so aggressive and yet it was working, that I don't need to worry I expect the crankshafts and pistons to arrive this week and then, I will have a look at the liners, bearings,inlet distribution and gear it up. The idea behind all this is the idea of using simple parts from different areas. 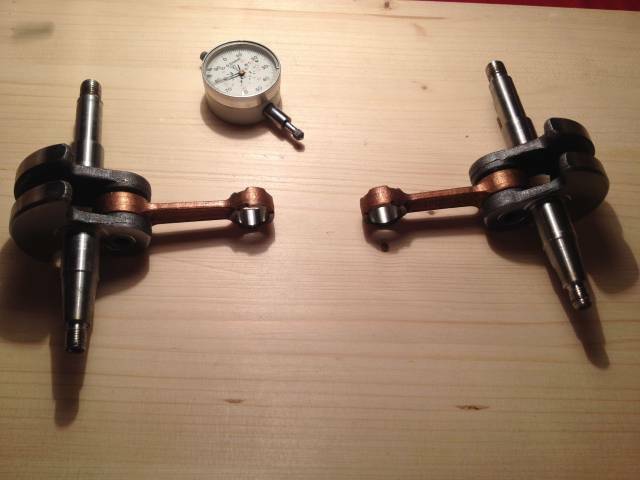 The crankshafts and pistons are from a cheap china chain saw, the gears will be either a chain drive from a bicycle (since the one cylinder version will be too weak for a big motorcycle chain) and-or gears from a motorcycle gear box, the overall structure will be cheap construction steel, the valves are from Briggs & Stratton and so on. Now, since I figured out, that I would need a valve-controlled inlet mechanism, the angular alignment of the crankshafts to each other will be zero. This means the displacement space of both pistons won't be overlapping. That again means I am much more flexible with the next step: The cylinder. Now, I could even use 2 separate cylinder liners on top of each other to have the overall length, which is needed for the opposed piston design. It won't be even a problem, because no piston/piston rings would travel over the touching point of the cylinder liners. Let's see. I am still figuring out, what I use as a cylinder liner and also asking some firms for chrome coating. My favourites would be either chrome coating or 303 stainless steel. The latter is used in another forum thread to line a 2-cylinder uniflow engine made of cast aluminium. I am really curious about how well it can take on the job. And actually, I am wondering, if brass as a cylinder would work, or if it is too soft/abrasive/whatelse. By the way, even though I don't respond to all comments timely, I do take my time to think about it and discover the links, even though I don't respond to it sometimes. Also replies, that seem to bring up arguments against my project will definitely be considered and I ponder about it thoroughly. Last edited by Ramón on Fri Jan 25, 2019 11:13 pm, edited 1 time in total. Something keeps ticking in my brain about opposed engine crankshafts. Weren't they set a couple of degrees out of phase for some reason? Compression boost maybe??? It's in there somewhere but refuses to surface. In the 1960s Commer (Rootes Group) had an opposed two-stroke dismal engine that only had one crankshaft, the power from the 'other end' was distributed by cranks and rods to the single crank. Late edit:- I've just looked it up Commer TS3, and it did have one crank, set under the cylinders (lying flat) and BOTH ends were connected by cranks and rods. Yeah, I've found quite some designs, where engineers catch the idea of an opposed piston engine and try to develop it further. But I felt all the moving parts were excessive. Especially the designs with one crankshaft and very long connecting rods to reach the opposed piston. Some opposed piston IC engines have offset crank angles. This way, the fresh combustible aerosol mix helps shove out the combustion gasses from the last stroke. But this can not be adapted satisfactorily to an opposed-piston steam engine. It could be used for pre-fill-settings like is the usual way for steam engines, but in general, the crank offsets have to be significant to get a proper displacement space. A normal uniflow steam engine with the same bore and stroke would in this case probably be a better choice, as it would have an order of magnitude more power I estimate. That is why I go another way for my opposed-piston steam engine. He follows the concept I also originally had in mind. Without any additional valves, the pistons double as valves themselves. He masters the problem I got by using a design with 2 different strokes. So, the piston with the smaller stroke is less an energy-producing piston than the other one and a step closer towards a valve. The different strokes provide for a much better expansion than with identical strokes. Though, he also hit the problem of steering the engine, as I also had. But his concept would definitely work and make good use of a crank offset (shown in his opening post of his thread linked above). The only valve-less way to steer the engine would be to change the offset angle between the crankshafts. I found 2 ways (either by an adjustable chain gear or a gearwheel mechanism) to do so, though with a big disadvantage. The mechanism would work against all the engine power, unlike a separate valve train. So, a governor would have to be very strong/hydraulic to overcome this (And the problem with the small effective displacement space described above would still be there.). The lever at the side pulls the small sprocket wheel on the left into the chain. 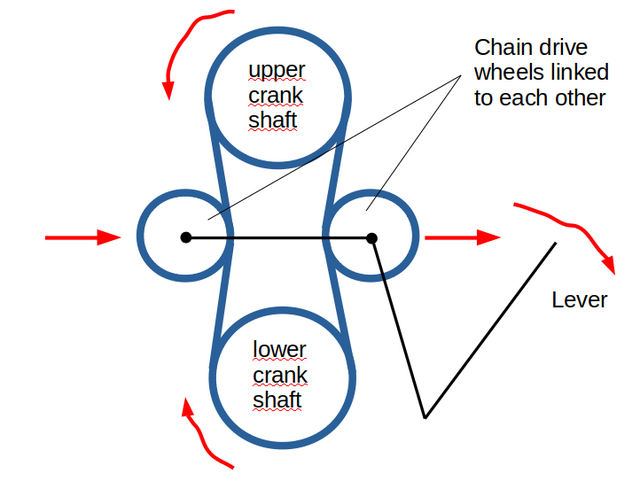 This neccessitates a bigger lenght of the chain to be on the left side between the crankshafts, causing the crankshafts to alter their angular alignment to each other. All the while on the right side, the chain would become stiffer, straighter, "shorter" and the small sprocket wheel needs to travel outwards to give some space. But the issues remain: The full load has to be overcome to alter the power output and the small displacement space remains. That is why I chose to include inlet valves, rendering crankshaft offsets obsolete. Now, the pistons move away and to each other perfectly synchronous, using the TDC of each piston as the intake side, plus giving each piston a separate exhaust port. Like 2 single-acting uniflow steam engines sharing one cylinder head side. To realize an opposed-piston steam engine, that can have the same efficiency as a normal uniflow engine and is still steerable, the easiest way would be to have inlet valves. Last edited by Ramón on Wed Mar 06, 2019 1:02 pm, edited 7 times in total. I write so much here, but it is such an excting project. After I thought a little about the two inlet valve systems I wrote about before, I tried to find a way to evade the sealing issue many rotation valves seem to have. Reading interesting stuff about the cross rotation valve engine and comparable designs, one solution to keep the valve sealed is to build a tapered valve body. But I thought about using a simple tube design, whose circumference is not complete, leaving a gap like the gap in a piston ring. The ratio between this angle and a full circle would directly describe the cylinder fill. So, with the incomplete circle of the rotation valve, the valve body should gain elasticity. Now, the pressure from the fresh steam coming from inside the rotation valve would work to expand the rotation valve body, pressing the it against the inner wall of the valve case. The thing to worry about would be to design the pressure-affected area of the valve in a way to not be too big and cause too much friction and still seal the valve properly. But I am slightly more inclined to use poppet valves, and this has one very important reason: The poppet valve will open away from the displacement space, against the steam intake pressure. That means I would not need to worry about water hammer. I want to keep the engine as simple as possible. Now, the crankshafts have finally arrived and I can order the bearings and seals. I had to wait until they arrived to take all the messures directly from them. I knew they are for a 52cc chainsaw and of course I had the overall dimensions, but when you have these little crankshafts fit well in your hand, they really feel small. I am very content with the size of the crank webs. They are only 2.2" / 5,5cm in diameter. This means I could use much smaller box tubes for the crankcases than anticipated. When I finish, I will make a complete list of parts, where I got them from and how much they cost. Now, that I could take all the messures I needed to know to order the other things to build the one-cylinder "beta test bed" of my opposed-piston steam engine, the project gets solid. I only need to finish the head stock of my home built lathe. How's your project progressing? I'm intrigued by it.